The Rotary Platform Abrasion Testing method was introduced in the 1930's and has been a popular method for evaluating abrasion and wear resistance. 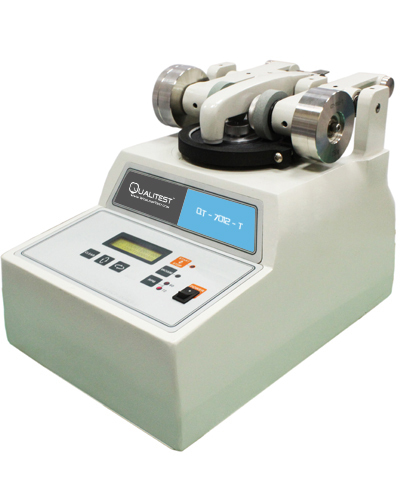 Qualitest Rotary Abrasion tester is designed for determining the resistance of cloths, paper, paints, plywood, leather and natural rubber to abrasion. Resistance to abrasion is defined as the ability of a material to withstand mechanical action such as rubbing, scraping, or erosion. The test is made by abrading the specimen against the sand wheel. Machine can be connected to a vacuum cleaner. ASTM-D1044: Specimens test disks are spun on a turntable and are abraded by a pair of abrading wheels for a specified number of cycles under a specified load. The test method specifies that the change in haze of the test specimen be determined as a measure of abrasion resistance. It is more common, however, to see abrasion resistance reported as the change in mass of the test specimen or change in mass per number of cycles. Mass change is due to material loss from abrasion.